Understanding layered software architecture is essential for understanding basic Magento product organization. In this article we are going to provide a detailed explanation of each of the 4 layers in Magento 2 and the way they are used in Magento 2 application. After that we will take a close-up look at Service layer, there is a lot to talk about. Presentation layer includes a view of the administrative part of the site, an API call, and a view for site users. This level consists of such components as layouts, blocks, templates and controllers. The view code controls the user/administrator interaction with the store and its appearance. Presentation layer components call the Service layer, which in its turn sends queries to Domain layer. Third-party modules using service contracts. (optional) implementation of service contracts. Performing additional business logic. For example, a resource model can perform data validation, run processes before or after saving data, or perform other operations on the database. If you expect to return multiple items from a database query, you must implement a special type of “Resource model”, known as “collection”. “Collection” is a class that loads several models into a structure similar to an array, based on a set of rules. 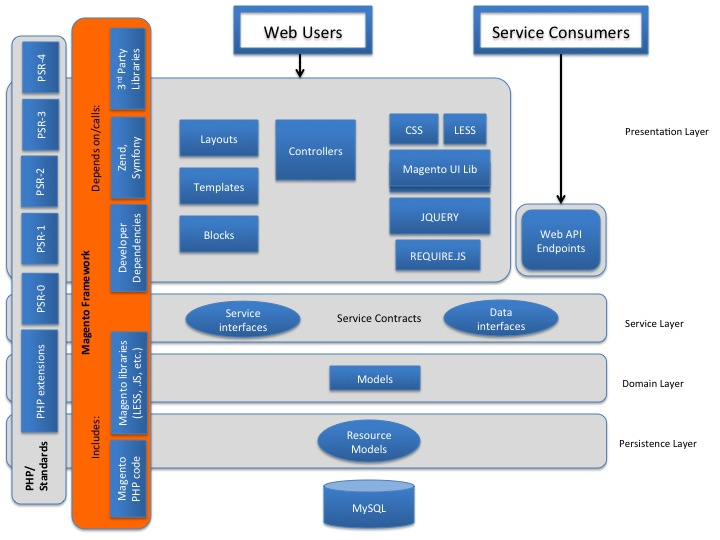 Now let us take a closer look at Service layer in Magento 2. Service layer In Magento 2 is a new layer that lies between Presentation layer and the business logic. The goal is to make all calls from other modules, as well calls from Presentation layer (blocks, templates and controllers) pass through Service layer. Besides that, Service layer can be easily opened as a REST web service or a SOAP endpoint. To implement CRUD in Magento 2, we need to describe the repository interface and implement it. We can take the Customer Repository Interface as an example, which describes the methods of working with the customer object. As you can see, this implementation simplifies the work with different versions of the module, since we have one entry point through the API and the implementation is separated. If a new mandatory field is added to the entity, it is going to be an exceptional case. * Copyright (c) Magento, Inc. All rights reserved. * Create or update a customer. * Interface for managing customers accounts. * Check if customer can be deleted. * Interface for retrieval information about customer address attributes metadata. Service layer is not mandatory, however, Magento developers recommend it for developing your modules. Magento developers plan to convert all their internal modules to using this layer. Its usage leads to a slight loss of productivity, which is insignificant compared to the advantages of this approach.